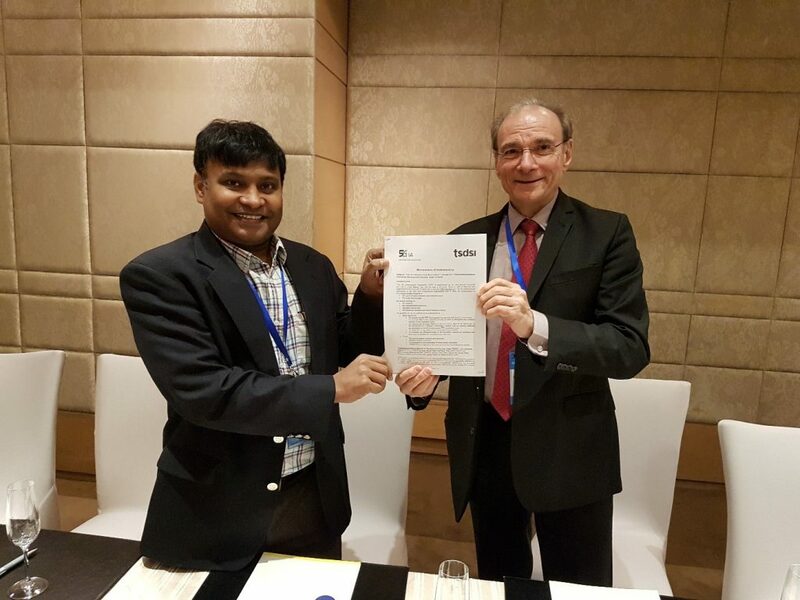 Brussels, May 2nd, 2018 – Telecommunications Standards Development Society, India, India’s Telecom SDO and 5G Infrastructure Association, representing the European industry in the 5G-PPP Research Programme, have signed a Memorandum of Understanding to foster collaboration on 5G development. Support for global regulatory process in identification of Frequency bands and spectrum arrangement for 5G technologies. The envisaged means of exploring these collaboration opportunities may include, but are not limited to, the exchanges of information /documents, meetings, workshops and other joint initiatives with mutual agreement. TSDSI and 5G IA will seek to develop and deploy mechanisms to promote 5G-related R&D initiatives based on the aligned opportunities identified by both parties. The first bilateral meeting between the two sides was held in Beijing on Apr 12, 2018, on the side-lines of the 3GPP PCG/OP meetings. Items like conducting a joint workshop, setting up of test beds and specific topics of mutual interest were discussed at the meeting. Telecommunications Standards Development Society, India (TSDSI) aims at developing and promoting India-specific requirements, standardizing solutions for meeting these requirements and contributing these to international standards; contributing to global standardization in the field of telecommunications; maintaining the technical standards and other deliverables of the organization; safe-guarding the related IPR; helping create manufacturing expertise in the country. TSDSI (website https://www.tsdsi.in) is registered as a society under India’s Societies Registration Act XXI, 1860 and is recognised by the Department of Telecommunications, Govt. of India as India’s Telecom SDO.